If you look at your tent, and notice there is a rip in the fabric, chances are you aren't exactly happy by this. But rather than freak out further, you can rectify this problem and you and your tent can go on to have many happy camping moments together. ​We take you through some steps to make tent fixing easier and not too tricky. Because who wants to have to deal with tricky tents? The information below is for nylon tents. 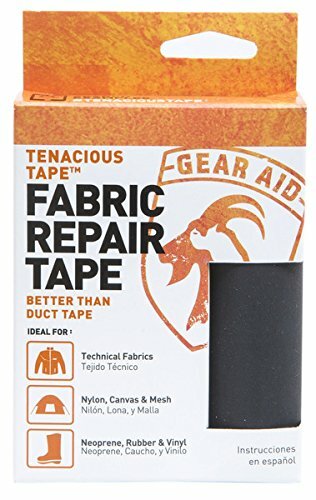 Assuming it's nothing too huge (and if so, you need to read on) one item we use and recommend is Tenacious Tape. If you don't have any, go buy it. This Tape is waterproof, all purpose tape and can be used on all your outdoor gear (we recommended it in our story on how to fix a leaking sleeping mat). Make sure the tape is larger than the the rip, by at least 2cm on all sides. Peel off the backing on the Tape, and press it over the small rip/hole on the fabric that is inside the tent, pressing down firmly and smoothing out any bumps or bubbles in the tape. You want to make sure its firmly adhered to the material. Apply the Tape on the other side of the fabric (outside tent fabric), so you have double strength tape over the rip. Optional step: If you don't want the Tape on the outside of the tent as mentioned in step 4, you can apply Seam Grip to the tear on the outside of the tent. You will smear the Seam Grip over the tear, and the surrounding area of the tear - you can do this with your finger, or a clean stick, or whatever you have handy! 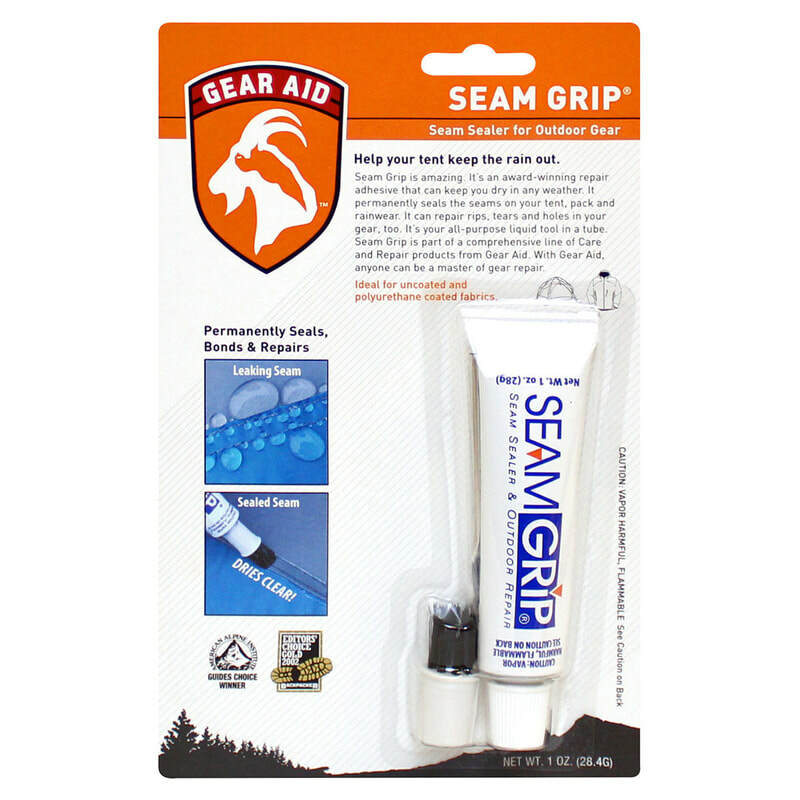 Allow Seam Grip overnight to fully cure. A larger tear can mean more work. You can always try Option 1 - using the Tenacious Tape and Seam Grip. That's the easiest option. But you may have to look at the sewing method, which isn't always ideal, and needs a bit more skill. Firstly, you can't just use any old thread you have lying around the house to sew on buttons. You will need to source a special polyester thread and appropriate needles. One thread that is mentioned frequently is Gutermann extra strong polyester thread. Try looking for it on eBay as your local fabric store might not have the right one. To find out about sewing in more detail, and tips you need to be aware of when sewing with this sort of fabric, you should read the story which covers tips on sewing ripstop nylon fabric. Need advice on threads and needles for the job? Read these tips on sewing your own gear. After a successful sewing of the rip, you should apply Seam Grip over the sewing to help ensure no water leaks through. If you aren't too keen to attempt any of the above options, you have a few alternatives. Firstly, you can let someone else do it. Type into Google "tent repair australia" and you will come up with a few companies who can do the work for you. It will cost you but if you have concerns over your ability to perform the above options, then it might be worth considering. Secondly, you could use duct tape on the tear. But we don't recommend this. Duct tape is fine in an emergency, but for longer lasting repairs, duct tape will start to fray and come off the tent, leaving a big sticky mess on the tent. Lastly, you could apply a Tent Repair Kit that the manufacturer of your tent, may supply with your tent, or be available for separate purchase. Best of luck with your newly repaired tent. And if you have a leak in your sleeping mat, we have answers on that as well! More tips on how to care for your tent are here. Caring for your camping gear - how to look after it when the trip is over.